The adage “If I can’t dance, it’s not my revolution” from 19th century activist Emma Goldman rings true today: For Aji Piper, 17, music was a natural gateway into climate advocacy. 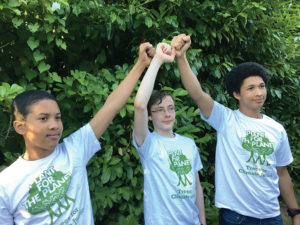 The activist teens, from left to right: Adonis Williams, Gabe Mandell and Aji Piper. Courtesy photo. Aji is one of three young men from Seattle coming to Sandpoint to discuss their experience as climate activists. He is joined by his brother Adonis Williams, 12, and Gabe Mandell, 15. Piper is a is a plaintiff in the groundbreaking federal lawsuit filed by 21 youths on the grounds that the government has taken aggregate actions that unjustly subject future generations to the consequences of climate change. The trial is scheduled to begin in U.S. district court in Eugene, Ore., this February. Piper, Williams and Mandell are also involved in a similar suit against the state of Washington, originating from the state’s denial of a petition seeking rules regulating carbon dioxide emissions as prescribed by the newest and most advanced climate data. They are supported by Our Children’s Trust, a nonprofit dedicated to securing young people’s legal right to a stable climate. “I’ve always had a deep care for people and the environment, so activism was a no brainer,” Mandell said. He has been involved in activism since fifth grade. As young people, the boys face a unique array of challenges, some even stemming from fellow advocates. The trio agreed that people often disregard their activism because of their age. Williams said that many adults, especially government officials, accuse him of being merely a “puppet” for other people’s agendas because he is young. The boys don’t let that get them down. Through persistence, they have earned national regard in the activist community regardless of their age. “When you show people that you really deserve their attention, it makes a bigger impact, I think,” Mandell said. Per the invitation of local climate protection groups, the three activists will visit the Gardenia Center on Aug 12 at 12-1 p.m. for a musical performance and Q&A session. One topic of discussion will be the potential of a chapter of the international nonprofit Plant for the Planet geared towards offsetting CO2 emissions by planting trees being created in Sandpoint.